Every galli has a chai (tea), fastfood, idli bandi. Roads are one’s own property. Every other month someone gets us chocolates from US. Autos are a blessing and also our very own roller coaster rides. This picture describes a true hyderabadi. If you are a hyderabadi , I am sure you must have used each of these atleast once.:). Atleast i have. Yes, I think I’m an Hyderabadi cos I used each of them. Landed on your blog accidentally. Spent some chilled time here. I have used most of them rahter all of them :). 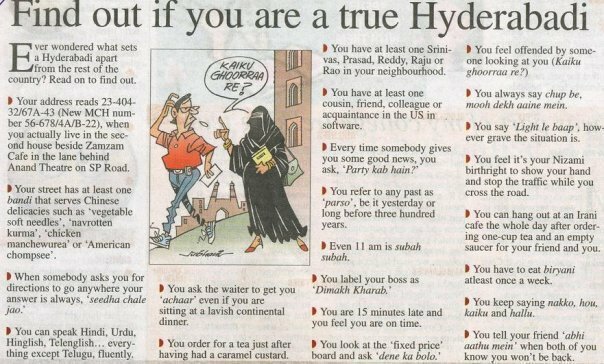 I think I am also true Hyderabadi in all sence and essence….Ha ha. Nice to take a notice of your blog today. Happy blogging…….